Cat and rabbits and pink silky cheeks all embroidered by hand…..
Each creature is completely unique so is a real treasure as Sasha makes them by hand using vintage fabrics from all over the place, more often than not there’ll be just enough fabric for one lone toy….which was the case with this lovely rabbit, the soft grey corduroy is so fine and she said it was a handful of scraps, but just enough to make a face, paws and feet…..
What I’m so excited about is that finally you can contact Sasha online…..she doesn’t have an online shop (yet) but does at least have a facebook page where there are photos of a small selection of some of her amazing makes, and you can contact her directly there….previously it was just a case of finding her at a few random craft fairs throughout the year so I think this will be much easier if you’re interesting in buying one of her beautiful creatures. This lovely grey bunny is one of her very latest makes and I would happily have given her a home. I love those delicate doiley cheeks and the hand stitched floral ears…..
Like I say, I already do have a fair few of Sasha’s beautiful creations….and as you can see I’m not the only fan of her work in our house…….this is one of our sofas. When we have guests I quickly lug all of these upstairs so there is room to sit as it’s a bit rude to expect people to sit on the carpet….the orange cat is huge, he’s about 4ft something tall. He was one of Sasha’s very early makes but I think he’s great…there are also toys on here that I’ve had since I was right little, and a much loved elderly auntie knitted the bear in the orange dress (she even has lacy edged knickers on)….from time to time Bernard decides to cuddle down amongst them, he’ll throw a few on the floor to make room for himself and then just sprawl out quite happy….and often a good bit of time goes by before I realize where he is. Another favourite from my personal collection is this gorgeous rabbit, she’s so glamourous. When Sasha first showed me her I just fell in love…..Her little fur jacket is a vintage dolls coat…I always think she looks like she’s off to a fabulous party where it will be just full of amazing people….she’s quite large, a good two foot as she’s got quite long legs….she also makes me think of music hall girls with those pink silky cheeks. And these are some other toys she made from a few years back, they all live upstairs and keep me company when I’m sewing….it’s been really amazing seeing Sasha’s style evolve slowly over time, I know she always laughs when she sees some of her earlier toys on display here but I thik they’re brilliant. All of her creatures are made by hand and more often than not are dressed in vintage doll’s clothes or are wrapped in delicate scraps of antique doileys or cloth. Sasha doesn’t really do bespoke or custom pieces to order as the fabric she carefully chooses to use to sew the toys is already very unique as it’s been brought from flea markets and brocantes, antiquey type shops and carboots and it’s pretty much impossible to then make doubles of anything made…..sometimes her toys come with beautiful vintage accessories like painted beds or prams but sadly she says these are becoming much harder for her to source. My most favourite toy she’s ever made though is my darling Miss Enid……in part because she was a present from my boyfriend but I also know Bernard adores her….if we ever had a fire Bernard would be tucked under one arm and Miss Enid the other….I love it when he snuggles up with his head in her lap, all purrs and contentment. I hope you’ll pop over and say hi to Sasha, and have a gander at her beautiful makes. As well as cats and rabbits she also makes ribbon cloud mobiles and very pretty bunting which would be ideal if you are decorating a nursery or bedroom and want that vintage aesthetic…she also makes the most incredible swan cushions but I’m not sure if she has any of those left for sale. Vintage knitting and getting all inspired by some charity shop finds…..
I’ve mentioned before my love of second hand shops and bricety brac markets, while I normally regard general shopping with a deep sigh, I can always be persuaded to stick my head around the door of a charity shop and will happily spend several hours if I’ve got the time to spare. I’m really lucky because Norwich has umpteen charity shops and while they aren’t as good as when I first moved here they can still turn up gold…… a case in point, I bought this gorgeous knitting bag for the princely sum of £2 a month or so ago….. it’s made really beautifully, fully lined inside with a very Autumnal gold fabric. I thought the little star stitch detail worked over where the granny squares join up was particularly eye catching….and while I’ve got various fabric project bags which are home to needles and wips, I’m always particualry fond of this style of bag. The other book is a great little pamphlet full of rather cheesy knits but you know what, there’s more than a couple that I’d like to cast on, and the instructions all seem reasonably easy so perhaps I’ll try out a couple and share on here for fun. I’m currently taking part in Joeli Creates Designer’s Bootcamp, it’s a free on-line workshop and runs for 12 weeks…it’s now about 2/3 of the way through but you’ll get the previous emails that she’s already sent out so you can soon catch up. There’s also a weekly question and answers session which is live. While it’s probably really geared towards people who want to create patterns to publish and sell, the advice she gives has been really helpful and she’s so full of little tips and thoughts for making your knitting even better….I’m really enjoying it and think she’s been very generous to offer it free. While I’m not particularly interested in creating something to publish however, so often now when I’m going for a walk over the marshes or meadows, having a poke about the hedgerows to see how the Autumn berries are ripening, I’m being inspired and would love to know how to incorporate some of that into my knitting or to work out what I need to do to cast on some of the things that are in my head, sort of “where on earth do I begin” and so Joeli’s Workshop has been particularly helpful in helping me make sense of some right tatty old scribbles and sketches. And then in Oxfam, I saw this book on one of the bottom shelves of the charity shop…it felt more than a little heaven sent… I love Montse Stanley, she’s very thorough in her descriptions and I’ve got one of her other books which I find helpful for explaining particular techniques. While some of the photos inside are rather dated with scary children, the information is great and I enjoy reading how she writes (she doesn’t waffle on and is straight to the point). What’s so nice about the book is how it explains really clearly about putting a design together, from considering stitches and yarns to the shape of what you’re knitting…there’s a nice section on different buttonholes. She then shows a range of different styles of garment details including body, neckline,sleeve, collar and then along side them is a clearer diagram explaining what you need to consider to knit that shape. There is also a guide on where you need to take measurements for a garment and whether you need to add an allowance for ease…..it’s very well written and was mine for £2.50. Wrinkled apples and the sound of my knitting….. The cupboards were getting a bit bare of basics after the holidays so I had to pop down to the shops at the start of the week, after a proper damp,dull and dismal weekend weather wise, which was actually a rather nice one for us…boyfriend spent the time stripping his computer and tinkering with it on the table and I sat on the sofa half watching old black and white films while knitting my shawl with Bernard asleep in a windowsill or on the back of the nana chair supervising… Monday surprised us by being really bright, and splendid, all clear blue skies and birds chirping. It properly felt like the start of a brand New Year, clean and fresh and brimming full of potential and who know whats. Walks to the shop involve strolling past the crab apple trees, skeletal and nubbly limbed with the odd mouldering leaf or fruit attached to twiggy tips. I’m so happy I made the syrups and jellies with the apples, it feels like I’ve captured a small piece of warm September, all orange sunshine and sweetness. Across the path are some bigger apple trees in a neighbours garden,a few wrinkled old apples still remain on bare leafed and gnarly branches, vinegary scented ghosts of Autumn, flame red, amber and golden yellow…..they’re the same yellow as my shawl. I love this golden mustard hue so much, evocative of so many things I see out on my marshy meanders, yellow bottomed bees, gorse and broom blossoms when it’s all overcast, October leaves and lichen on trees and the goldenrod that grows in abundance around my favourite blackberry bush…..it’s such a warm colour and will even match my Ella Gordon gloves….As it’s wool the colour seems that much more warm, it’s a strong colour but it’s such a natural and familiar one, not eye aching and somewhat vomity coloured like some acrylics I’ve seen….. Some Christmases ago my boyfriend bought me a box of delights, a little leather suitcase full brimming with vintage haberdashery pieces…along with a pair of beautifully sharp embroidery scissors and Dewhurst Sylko threads, were no end of little boxes and tins, and I felt rather like Howard Carter opening them all to see what was hiding inside…”wonderful things”…… one of the tins of wonderful things held a collection of glass beads all strung in a higgedly piggedly way, and I’ve always wanted to use them but have never really known what to make with them…..a lot of my fancy sewing or knitting notions have been presents from friends, family, people I love who I straight away think of when I use these pieces….and so I thought to make some stitch markers with the beads then I’d be using them plenty rather than have them just sit all tucked away and half forgotten. I was going to use jump rings as I’ve already got some stitch markers that use those, but they do snag a little if I’m not super careful, luckily the Jamieson and Smith wool is nice and robust and can cope with the odd catch or snag but I wouldn’t want to use those markers on anything too delicate..then I remembered an old jewelry fixing I had kept and ferreted away from a broken necklace, it was part of a toggle clasp and I thought it would be perfect, so I bought a little packet of them and spent some time over the holidays making stitch markers from the beads…so now when I use them I think of my boyfriend but also Ian* and his dirty little hands as I suspect it was him who had threaded up the beads originally. The little head pins I used were from a local bead shop and they have tiny silver pearls at the bottom of the pin which fitted up against the beads perfectly…I’ve found the toggle clasps fit up to a 6mm needle fine….they feel so nice to use, and really do help me stop making some silly mistakes with my knitting. What with the shuffling rapsy sound of the wool and the soft wooden resonance of my needles, the jingling of the markers is making me feel and sound somewhat like a one man band when I’m knitting…..
*inside the sewing box was a piece of carefully preserved card with rows of brightly coloured wool sewn in a running stitch…on the back was a note from a very proud grandma…..it’s become one of my most beloved treasures and I wouldn’t part with it for the world. I’ve just updated my Folksy shop and have included some of the latest small size stockings I’ve been making up over the past few weeks…..these are made from beautiful old Witney wool blankets which really have seen better days…..they aren’t always in the best condition when I get them but a few spin rounds in the washing machine tends to brighten them up….sometimes the fabric begins to felt a little but when they’re a bit thread bare I tend to find that a good thing. Along with the softness of the wool, I love the delicate colours, mostly I find cream ones, blue or green but every so often I’ll find a lovely bright colour like this pomegranate red one….it’s a gorgeous orangey red. A few years ago me and Sasha went halfsies on a really red blanket at a car boot, it was the exact shade of a smashing lipstick I used to wear by Yardly, which made me feel like Kathleen Byron** whenever I wore it…. All the embroidery on the stockings is done by hand, and I use tapestry wool and threads that I source locally from antique markets and vintage shops, carboots and the like. It’s lovely to sew with and the older colours blend together so well. Inside, the stockings are all fully lined with a rainbow striped cotton fabric (it started life as a duvet and I think the rainbow stripes look perfect for Christmas stockings)….. When I set up my stall at fairs I take along a couple of small bears with me to pop in the tops to show what can fit in there, but little “one ear” stays at home, he’s too precious to lose and is a little bit wobbly, his joints are too loose to cope with the constant picking ups and cuddlings which the other fellows will put up with quite happily (they’re a bit more robust)…..
I’ve tried to keep these stockings pretty simple in tone, I’ve left off the pompom trimming from other years as I like the bared down look and think it suits a vintage aesthetic a little better….also it’s very hard to find trimming like that nowadays that isn’t new. Where I’ve been able to I’ve cut the stockings out right on the edge of the blanket, so they get to keep the original blanket stitch edging and I think that makes for a nice little nod to where the fabric come from. Apart from the ribbon which I wasn’t able to source second hand this year the stockings are all made from re-cycled/vintage fabrics. If I’m not careful, sewing can take over everything else right now, if it’s not craft fairs then there are commissions and gifts for friends and family to make…my sewing pile is in serious danger of toppling over and it doesn’t seem to be shrinking…. however, I was determined to catch some quiet time last week and bake some bread….a slight variation on my usual recipe as I only used a handful of linseed along with some grated apple and oats. It didn’t last long so I guess it was approved of…even when I know I could walk down the road and buy bread there is something so rewarding in rolling up my sleeves and baking my own, to be honest the actual making doesn’t even take that long, a few minute of mixing ingredients and allowing them the time to rise and do their thing..and it’s only the kneading that makes a little bit of a mess but mixing everything together and feeling the dough form beneath my fingers helps me totally relax and unwind…you can’t feel stressed or anxious kneading bread dough…instead I feel a wave of calmness envelope me and within seconds I’m quite content. I’ve also been making more dark and sticky gingerbread…our home smells lovely and spicy right now…I don’t notice it so much when I’m actually here all day but if I have to go out to the post office or into town then I’m very aware of the soft spicy scent when I turn the key in the lock and step indoors. My last fair for Christmas is this coming Saturday at Clutter City which is held down at Norwich Art’s Centre. There’s a listing of some of the stalls who’ll be there over at the Clutter City facebook page…if anyone goes who reads my blog if you say the magic word* then you’ll get 10% of any purchase. *no prizes for guessing what it is…magic word is “Bernard”…..he’s been my little assistant today which explains why there’s lavender everywhere…I don’t know what he does but within minutes of a bag being opened he’s suddenly covered with it and inevitably it’s soon to be found all over the house. **she was the nun in Black Narcissus who wears that incredible red lipstick and then has a fight with Deborah Kerr and she was also in A matter of Life and Death but she didn’t wear lipstick in that…..
On Monday I had a little day trip to Bungay to see a couple of very dear friends and also to purchase a few haberdashery items I’d become low on. First up was a pop into Wightmans which is a lovely shop, it’s what is called a traditional store and by that I mean the staff are nice and friendly and they seem to stock a little bit of everything. They have a nice selection of velvet ribbon and pom-pom trimmings which I was running short on (I use them for my Christmas Stockings)…and I also picked up some green darning wool to mend my socks (not just any socks but hand knitted ones by Anne the queen of knitting….I’ve worn them half to death and the bottoms are becoming somewhat threadbare). One of my favourite vintage stalls from Norwich Market, the lovely Ruby Tuesday has now moved to Bungay to a proper shop. So had a little browse in there and it was vintage heaven. Full of very swishy frocks, vintage knitted woolies, (including a smashing selection of knitted tank tops which are always my favourite) and some lovely tweed jackets. Along with the clothes there were some other vintage pieces on sale (there was a beautiful little red flask and some really nice pieces of china). There was lots that I could very easily have bought, however, this close to holiday shopping and numerous family birthdays I had to be very good….however after Christmas….it may well be another story! They also sell vouchers which is particularly handy if any of my family is stuck what to buy me as a present this year! 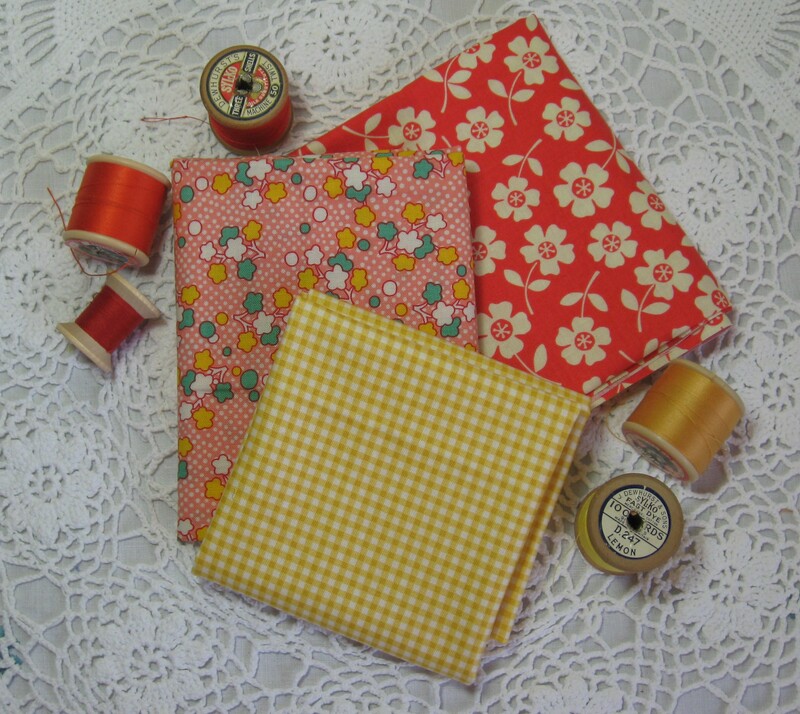 After sewing the quilt for Miss Olive I needed to top up the fabric collection, and so bought some 1930’s inspired fabrics from Sew and So’s. 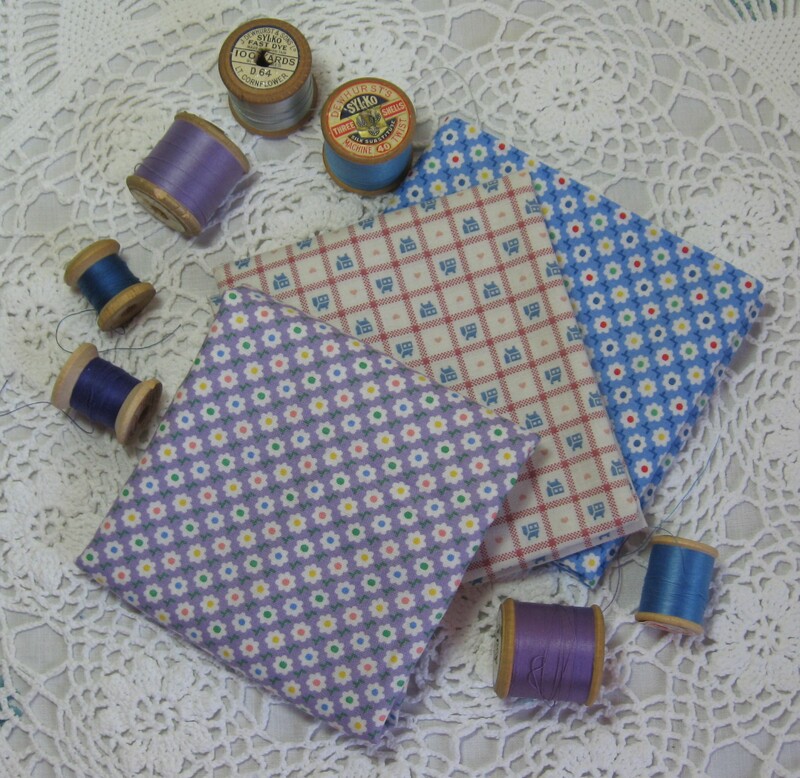 I really like the fabric with the little houses, and then couldn’t decide whether I preferred the blue or purple flowers….so went for both. I only really ever buy fat quarters (which for ages I thought were called fat quilters) so I wasn’t really going too crazy. The fabric in the middle is one of my all time favourites and have bought it before in green , in purple, and in this salmon pink. However I only had a teeny bit left in the salmon so while they had it I bought it. 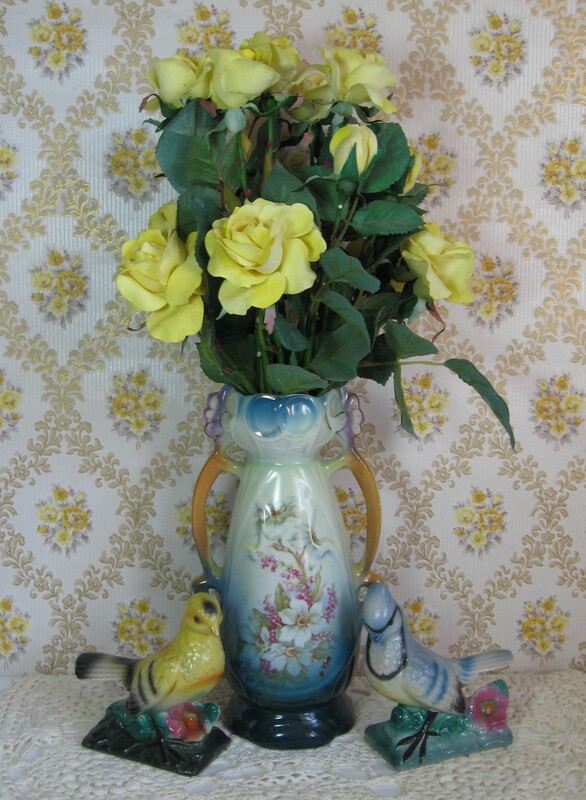 The yellow gingham is also a favourite and have been buying a variation of this fabric for over a decade. It never fails to raise a smile with it’s cheery colour. If a fabric could sing then this one would whistle as well. Finally, I then saw the red floral fabric and couldn’t resist. The colour is brilliant, a proper orangey red which reminds me of a Yardley lipstick my Nanny used to wear. The print is a little larger than I normally like to use but I loved the colour so much. The rest of the time was spent in drinking lots of tea and eating lots of biscuits) including pink wafers which are my favourites….I don’t buy them very often because I can wolf down a whole packet without realising what I have done) and spending some time with two of my favourite ladies. I also had my crochet bag, which was full of my Jamieson’s wool purchase and spent the bus journey crocheting little leaves ready to sew up in to flower posy brooches. My Christmas craft fairs are less than two weeks away so any spare time is spent sewing and crocheting.